Henry A. Rosenberg Jr. has striven to always offer help when a civic leader asked for his time and efforts, and as a result he has played a key role in institutions all over Baltimore. 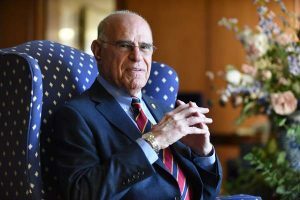 Rosenberg, who recently celebrated his 88th birthday, is the active chair of family-owned Rosemore Inc., which specializes in oil and gas exploration, production and transportation. He is also former chair, president and CEO of Crown Central Petroleum Corporation, once one of the largest public companies with headquarters in Baltimore. Those contributions include being a principal sponsor of the Brooks Robinson Statue on Washington Boulevard, which was dedicated in 2011 just outside Oriole Park. His board memberships read like a Who’s Who of Baltimore. He has served as a chairman of Kennedy Krieger Institute, Baltimore Area Convention and Visitors Association, director at the Heifetz Institute and director/trustee at Johns Hopkins Health Systems, Goucher College, Loyola University Maryland, the National Aquarium, the Greater Baltimore Committee, YMCA, Boy Scouts of America, and the United Way of Central Maryland. Rosenberg urges the next generation of business leaders to contribute to the growth of communities where their businesses operate and to encourage their colleagues to do the same.